Your Dentist in Hillsboro Says Celebrate with Excellent Nutrition! March has been designated as National Nutrition Month, and medical professionals around the country are using this as an opportunity to encourage people to focus more on maintaining a healthy diet. As you read on, learn how the foods you consume play a major role in the quality of your oral and overall wellness. Then, discover the benefits of visiting your dentist in Hillsboro on a consistent basis! The famous quote, “Let your food be your medicine and your medicine be your food,” has been attributed to the forerunner of modern medicine, Hippocrates. So it’s only fitting for medical professionals to join forces to promote healthy eating in the month of March. 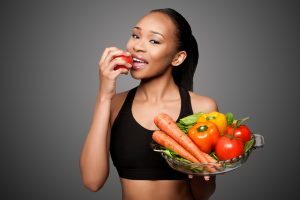 As it specifically applies to your oral health, though, eating whole foods like fruits, legumes, vegetables, grains, healthy proteins and other such items plays a critical role in maintaining healthy teeth and gums. One of the main attractions of taking this approach to eating is that it helps to keep bacteria at bay. Always present in your mouth, bacteria are tiny organisms that rely on leftover food for sustenance. Their favorite source of nutrition, though, is sugar. Therefore, when you consume foods that are high in processed sugars, you run the risk of attracting the unwanted bacteria. This can have a significant impact on your oral health because bacteria release acids as they feed on any leftovers, which can eventually result in tooth and gum decay. Over time, if bacteria are allowed to grow unfettered, periodontal disease can develop, which is the inflammation and eventual deterioration of the gums. If it is ignored, there are some serious health problems that can emerge like heart disease, stroke, hypertension, oral cancer and Alzheimer’s disease. Again, this domino effect of declining health can partly be attributed to poor eating habits. So during National Nutrition Month, celebrate by committing to eating foods that will add life to your years. To further boost your oral health and overall wellness, now is the perfect time to visit your Hillsboro dentist for preventive care. The combination of a thorough cleaning and a careful examination will provide you with a clean slate of health so you can lead a more productive and fruitful life! Dr. Brandon S. Kearbey earned his dental degree from Loma Linda University. Throughout his career, he has maintained a commitment to providing the best in dental care to his patients. To continue to broaden his knowledge, Dr. Kearbey has received several hours of advanced training from Spear Education in multiple treatment modalities. He helps patients enjoy the absolute best in oral health at The Dentists at Orenco Station, and he can be reached for more information through his . Comments Off on Your Dentist in Hillsboro Says Celebrate with Excellent Nutrition!